Already under construction, traffic was further delayed near the Tobin Bridge due to a rollover crash early Friday. 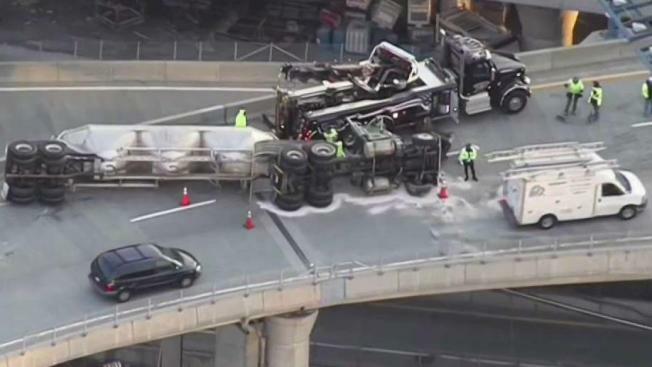 A rollover crash involving a cement truck right at the start of the morning commute created a 9-hour traffic nightmare in Boston on Friday. The accident happened shortly after 5 a.m. near the Zakim Bridge on the ramp from the Tobin Bridge southbound to Interstate 93 south and to Storrow Drive. The crash backed up traffic for miles. The contents of the truck did not spill out onto the roadway, but they made the truck so heavy that it took two separate attempts using three cranes to get it upright. "That was pretty bad, especially with all the weight in the back with the cement," said Christine Belinski of Charlestown. "Traffic is already crazy here, as everybody knows, so just adding that on top of it, I'm sure everyone's commute was a little rough this morning." Beginning at 9 a.m., traffic on the ramp from Tobin Bridge to Storrow Drive was diverted to Rutherford Avenue as crews worked to remove the truck, according to state police. At 11 a.m., nearly two hours later, the truck was still on its side and only one lane of traffic was getting by. The truck was removed around 1 p.m. and the ramp finally reopened an hour later. Massachusetts State Police said the truck driver suffered minor injuries in the rollover. It's unclear whether they will be ticketed.